This is quite a long write up, so I’ve sectioned up the weekend by days/events. The last time I started my bike was in December of last year, where I uncovered some electrical gremlins, triggering inconsistent firing and starting issues. 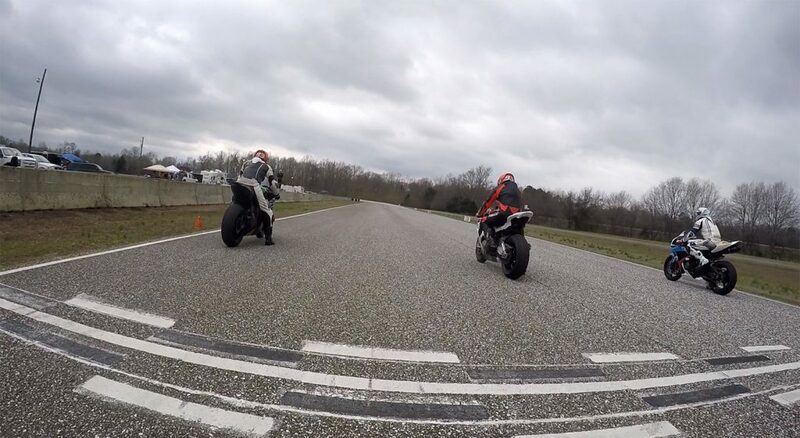 Prior to that, the last time I rode the bike was the Tally STT trackday in November where I had a water pump failure. Add to this, lack of any exercise and 0 training for 3 months – one could say I’m not really feeling confident going into the weekend. But life is life, and I can’t make excuses — just go into the weekend and try my best. Every race weekend I set a personal goal. It’s not ever how I place in the race, but more what kinds of lap times I want to target. Last year my PB lap time was a 1:03, and in the off season, a 1:02.5. This weekend I set out to achieve a 1:01. To help calm my nerves and perhaps give me a better chance of hitting that goal, I registered with John Cook’s Test and Tune trackday before the races. 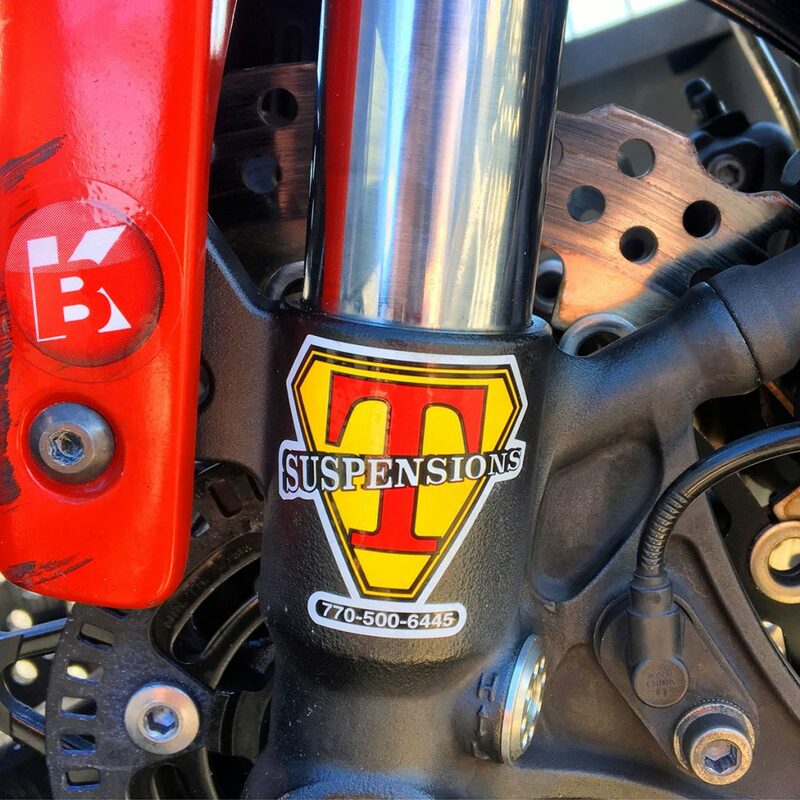 This gave me a little more confidence knowing I would have time to shake off the rust and get reacquainted with the old ZX10R – which by the way has an all new suspension setup from Mike Fitzgerald (aka Thermosman). The old suspension had the ZX10R sitting like a chopper with no front-end feel and refused to turn at speed without some heavy input on the bars. To be fair, I knew the bike was rather messed up for some time, but I just wrestled it around and said I would learn to ride a difficult bike in hopes it would make a proper bike that much easier to ride – and hopefully make me a better rider. I’m not sure it was a wise decision nor would I recommend doing the same to anyone — but that’s pretty much what I did for last season. But, now sitting with a taller (and non-seized) link and stiffer spring in the rear, and a tightened and tuned setup out front, the bike is ready to go! En route to Alabama, I check the weather forecast: high 60s to mid 70s all weekend — awesome! Saturday 20% of rain, Sunday 80% — not-so-awesome. Thankfully I still have a set of Pirelli Diablo Rains from last season I can run if needed. Given how rusty I feel, I’d rather not run in the rain on the opening weekend — but you can’t be picky when it comes to points and a potential championship! I arrive at Talledega GP Raceway a little after 7:30CT – with the time change it’s effectively 1hr travel time — which is great for going to, but not so great going home. Sun is shining and weather is still a bit chilly but warming up. Rolling through the paddock I see some familiar faces and a few new ones. Already it’s looking pretty packed for a pre-race weekend. I pit next to some old friends with Pink Wolf Racing, and begin unloading the truck. Last call for Tech Inspection is announced over the PA as I flip the Shark Kage into the bed, close the tailgate and roll the truck around behind the paddock. I say ‘hi’ to a few more friends and roll on down to the riders meeting on the Z where there’s always a great (but often gross) joke shared. First session is called and I suit up in my old Ballistik suit from last season. While I have a badass new Dainese Custom Works suit this season (Thanks Dainese! ), I decided not to wear it just yet as it’s still not broken in. I also figured since I have a new suspension to test, I didn’t want to introduce anything new variables that could affect how I ride or throw off the feel. Rolling out of pit lane onto the track, I’m still a little bit nervous. I know just to take it a little slower than normal and ease back into it — after all, it’s been a few months since I’ve been in the saddle. So I roll around at about 60% pace. Lap after lap I realize I’m no were near as exhausted by the end of a session were previously I could only manage 8 laps and I’d be pitting in panting and red in the face. Now, I feel like I’m riding a 600! A few more sessions roll by before lunch and I’m feeling pretty good. The bike handles amazing and I quickly realize I have an old habit from the previous setup which causes me to tighten the inside shoulder. It use to take a ton of force on the inside bar to keep the bike in the turn at pace; if I didn’t, the bike would want to stand up. But the second I relax my shoulders – the bike falls right in faster than it ever has. The whole first of the morning I ran my old Pirelli SC2/SC1 (front/rear) from last season. Hot off the warmers, I like running 36psi up front and between 25 and 26psi in the rear. By my count, they each had 90 laps on them by lunchtime. Even while sliding around on every exit, the bike — much to my amazement — continued to track predictably and on line through the turns. The aftermath of Dario’s unfortunate crash which happened moment’s before my crash. Feeling rather satisfied at lunch with how the testing is going, I thought I’d run one more session to really give it a shake down and try to put in a decent flying lap. I fell like my times are hovering around 1:03s which is what I ran in my last race here about a year ago. Only this time, I’m not having to push as hard to get there. After a good two warm up laps I follow a fellow racer around on a lap – I know he and I battled it out last season and ran similar lap times, so figured this was a decent time to assess how I’m feeling. We begin our drive out of Carousel onto the back straight where I catch a glimpse of a white and orange flash at the end of the track. Turns out it was another follow racer who had an unfortunate off and was tumbling through the grass out to the tire wall. Of course while barreling down into the brake zone around 130mph, I didn’t have time — nor did I want to keep following what was happening. I tuck in behind my friend and setup for Farmhouse (the same turn I bent my rims in during my first race). I look down the track as I tip in and release the brake approaching the apex, when out of my peripheral vision, the bike in front of me suddenly fills my vision. Before I had time to react — *CRUNCH* — the right side of my front wheel slices across the left side of the swing arm and begins lifting the tail of bike up and slamming the rear of the bike and rider into my fairing stay, windshield and brake hand. My friend is tossed into the air and into the ground head first into a body roll. My front brake reservoir is sheered off and spews brake fluid all over the place as the two tangled bikes eventually throw me shoulder and head first into the ground. The adrenaline soaked blood pumping through my body pulses up against my earplugs, slightly muffling the buzz of bikes rolling by under a red and yellow waving flags. After a head-to-toe check if everything is still intact, I stagger to my feet. 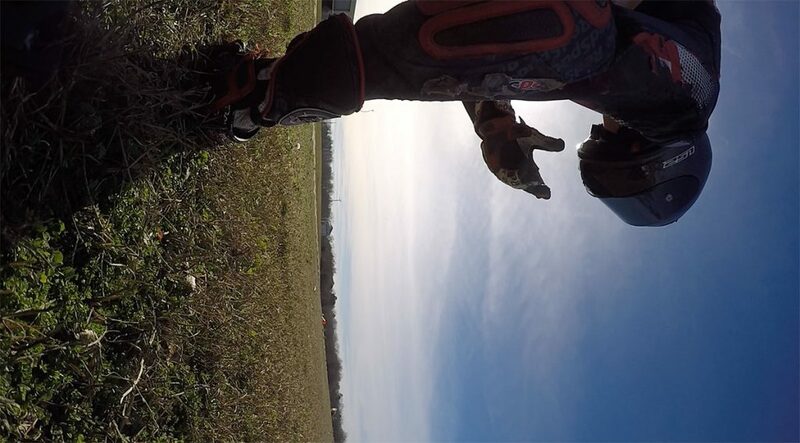 It’s only then I realize my shoulder took a pretty good hit into the ground… I walk over to make sure the other riders are okay, as I’m sure without any warning – that hit from out of no where had to hurt! My friend, clearly in pain and dazed (rightfully so) as to what exactly happened, check with each other that we’re otherwise okay. In disappointment (and frustration) we stare off in the distance at the now waving red flags all around the track. Medical rolls with the crash truck as the now three of us (including the rider who was already off in the field), are checked for injuries and the bikes are assessed and collected on the trailer or ridden back to the paddock. Thankfully we were all (mostly) unharmed and didn’t require a trip to the hospital. Kevin Netto and I putting Tim Price’s 6-in-1 alignment tool to great use. Rear wheel was tracking 1/4″ out of alignment. 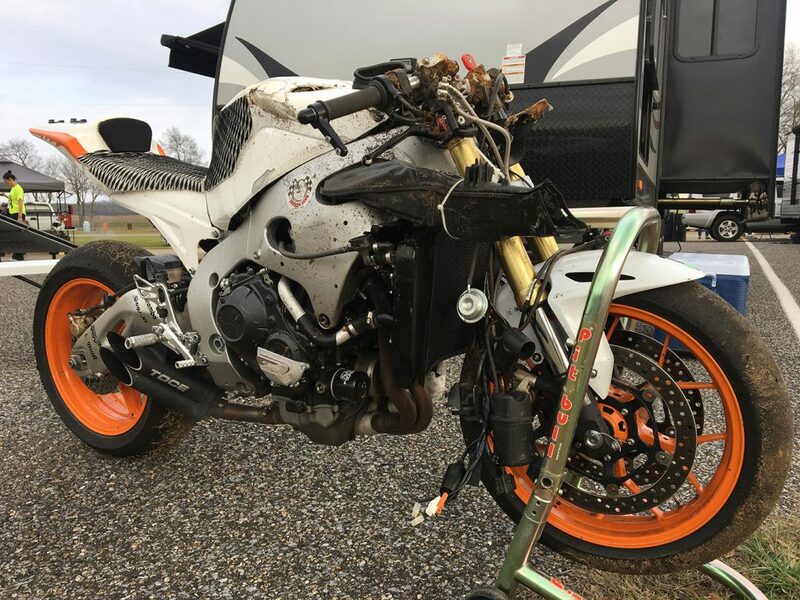 No one likes seeing their bike on the crash truck – NO ONE! Yet, if you’ve been in the sport long enough — you know it’s just part of the game we love so much. The risks are great, but the reward is even greater — and I don’t just mean winning. I begin stripping the bike down and wash up the brake fluid, checking for any leaks or other hidden damage. While I’m working on removing bits and pieces, several people stop by to see if I was okay and check if there was anything I needed. I can’t tell you how awesome it made me feel to know so many were checking up on me and willing to offer a helping hand. I truly love the bike life family. About an hour goes by and I have a list of parts to replace: front rotor, front tire, fairing stay, brake reservoir, possible master cylinder, brake hose, windscreen and a possible rim. Thankfully all other damage was minimal – and everything was still functional. Time to call Anna and break the news. It’s always good to call or notify your significant other as quickly as you’re able. It’s the worst feeling to hear about a crash from someone else first; as it let’s your imagination get the better of you. Anna was working that afternoon and had originally planned to come down to watch the races Saturday morning. With my list of parts sitting in the garage, I asked if she could come down a day early so I could get started on the repairs. Of course, without hesitation she said yes, and by that evening I had boxes of spares ready for install. With a plan set into motion, I walked down the paddock to check on the rider I hit. He was clearly in a lot more pain than I and we chatted about the incident. Thankfully neither of us wanted to hold a grudge and neither wanted to push blame. I was hoping he was still able to race later that weekend but unfortunately the whiplash was too severe and it just wouldn’t be safe to do so. I hated it for him since I really looked forward to racing against him this weekend. But we both know racing is a hobby for us, it’s not our lively hood or day job, and it’s not worth the risk. Till next time — hope to see him on the track again soon! As darkness set upon the track, I continued to make repairs to the bike. A few friends who have a little more mechanical background than I, came by and gave me a hand to reassure me the forks were still straight and things looked good for getting back on track. With all but one item fixed, I tried to relax and enjoyed some scratch-made chili surrounded by friends, music (thanks Braven! ), and beer — the best things anyone can ask for after a long and stressful day at the track! Saturday morning I wake feeling like I was just sacked by an NFL linebacker. My neck locked up, left shoulder and elbow swollen from the impact — I was beginning to doubt my chances of entering a race. But I had to put this out of my mind and first get the bike back together, or I really didn’t have a chance to race. I walked around asking if anyone had a spare brake reservoir and hose (why couldn’t I have an R6 like everybody else?). Thankfully a friend, coach and fellow racer in my group said he’d lend me his HP4 spare. With a few zip ties, safety wire, some fresh fluid and a quick bleed of the brakes — I had a working race bike again! NOTE: Much of what actually went on during this day and all the people who made it possible, can be found in greater detail on this FB post. Sunday morning, with barely a night’s sleep, I wake at 6am — physically and mentally exhausted with the left side of my body still pretty weak. Part of me wanted to just call it a weekend – yet there was a deeper part of me that wanted to push through and try a race or two for the sake of clearing my head and getting rid of the anxiety about how the bike would run under race conditions or how I would feel in a race after my crash. 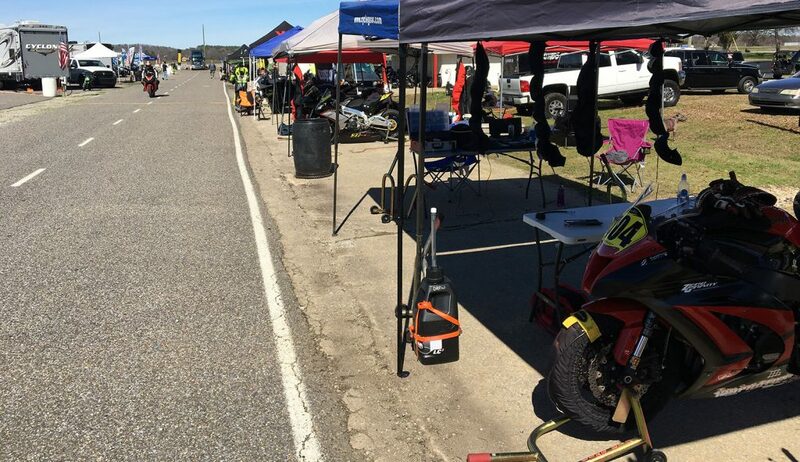 Without thinking I grab my wallet and race license, and zip the Z125 over to the tower to stand in line for registration (PRO TIP: Pre-register for your races – don’t be a sucker like me). From there I grab my helmet and bike and ride over to tech which opens in a few minutes. After the all green from tech, I roll back to pits and wait for my first call for morning practice. Still a little anxious, I nibble on the fresh-made jalapeño scrambled eggs and bacon breakfast, prepared by our good friend and fellow racer of 129Photos, Kevin Netto. Breakfast was delicious — but I have no appetite. Second lap — the bike power wheelies out of T2 approaching T3, and my left arm violently swings into the side my tank — “WTF was that!” As I look down and roll off the power. My left clip-on has spun on the fork and is now almost parallel with my gas tank. I know I checked those bolts, I tightened each one after checking the forks! Perhaps it was under pressure in the impact and backed out. Or maybe as I tightened one bolt the other became loose? Either way, I needed to fix it before the next practice. Back in the pits I quickly noticed a bolt in that left clip-on was missing. I grab my spare bolt box (super handy at the track) and really make sure these things are in good and tight this time! Since my session was cut short, I figured I should swap to some fresh rubber for the races and use my next practice to scrub them in. Tires are off in no time and handed over to James Bock at the Podium Motorsports Pirelli trailer. A few quick minutes later James had me set and ready to roll! These Pirelli Diablo Superbike SC1s are the last set of race tires I have left over from last season. I typically run an SC2 front for a little better front-end feel under braking — especially with the added brake force and weight of the 1000. But no time to worry about that now, I know the SC1 will provide tons of grip! Of course just as I think things are going smoothly, the front axel doesn’t want to go back in — this is the first time this has happened in all the years I’ve own the bike! After wrestling with a little cross thread — “Third call. Third and final call 750 and up Novice.”, rang over the PA.
No brakes… In my rush – I forgot to pump the brakes to set the pistons and pads! Talk about an easy and bad way to end the day – if not worse! Thankfully with a few quick taps on the brake levers, I was out to get a few quick scrub in laps. 1:01.007 – a new PB! In 5 laps, I managed 3 consecutive 1:01 lap times — 2.4 seconds quicker than my previous best recorded time in a race! I couldn’t believe it! I guess the little bit of frustration I felt leaving the pits in a rush gave me a little push and made me a little more aggressive than I might have otherwise been. I’ve crushed my goals for the weekend and couldn’t be happier. “I’m ready.” – I said to myself, and the butterflies in my stomach went away. Heavy gray clouds blanket the sky — chance of rain increasing from 30% to 80% by mid-afternoon. No time to worry about it now, I line up on the grid in the second row, surprisingly calm. It’s odd that my nerves get so worked up in the anticipation of the unknown; yet during the moment I was thinking about before, an overwhelming sense of determination and calmness takes over my whole body… I don’t know where it comes from. A pop of green appears and I drop the clutch and crack the throttle. The bike lurches forward and hooks like it’s never done before (I actually got a decent start for the first time in my race career! lol). 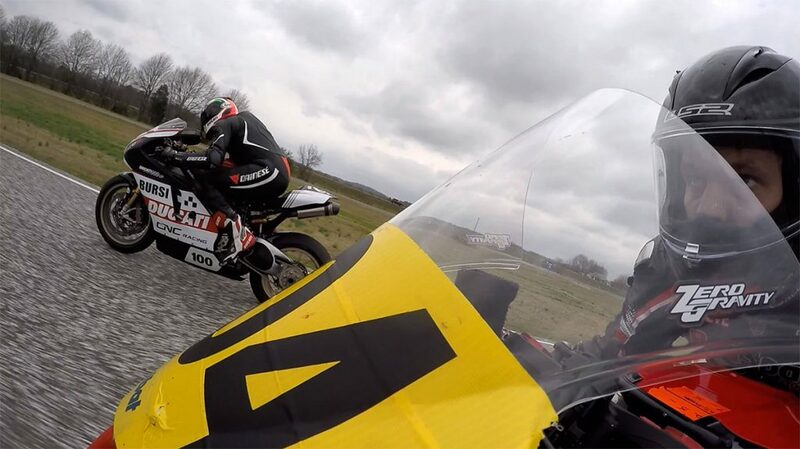 The world around me blurs as I launch past the front row and pull along side the lead rider, my friend, Dario. As we approach tip-in, I see an inside line and I take it. We roll into T1 side-by-side and I see out of the corner of my eye, Dario has run it a little deep and I have a chance to take a hard drive down the long straight into T2. The first time I’ve ever led a race I turn into T2 and my only thought is to keep it smooth and tight — be patient and try to be smooth when getting back on the gas. I hear the howl of inline-4 and v-twin engines echoing behind me in stereophonic sound. If there were ever such a thing as a banshee, I bet this is what it sounds like. My head down, I try to keep relaxed on the bars — something I’ve been struggling with all weekend. With each corner I hear the banshee fading into the distance until I can only hear the scream of my Kawasaki and Graves exhaust bellowing beneath my feet. Lap after lap, I wait for the banshees to return. By the half-way mark I notice my left should and hip are beginning to fade. A pressure and pain begin to set in, and a sliver of doubt enters my mind. “What if this gets worse? Can I keep going? For how long? Should I slow down?” Thoughts start to distract from my focus and I quickly realize I’m not thinking ahead as I blow my exit in Farmhouse. “I have to keep pushing. I can do this” I tell my self. Laps begin to blur together, and I’m looking for a white flag as I pass by the front wall… nothing… “What lap is this? How did I lose count?” At this point I’m starting to feel my mouth run dry and my breathing has gone from paced to laborious. I tip into T1 and I tell myself to relax, and breath a little slower. My left shoulder beings to burn and my lower back is feeling weak as I ride the wall into T2. “Just one more lap, let’s just back it down slightly and take it home.” I tell to myself. As I approach Farmhouse, the final tight left turn which leads back onto the front straight, I rollout early, brake a little lighter (mainly to ease up on my now exhausted back and shoulder) and throw it down one last time. Bucking and sliding with the hammer down one last time, the checkered flag draws near and a smile begins to creep across my face. Only I’m not smiling because I won the race — I’m smiling because I finished what I set out to prove to myself — prove to myself that I can get back out there after all that had happened over the past few days, push through the pain and get rid of the doubt! With this weekend being a double header, there were a lot of points up for grabs that could make or break a season. 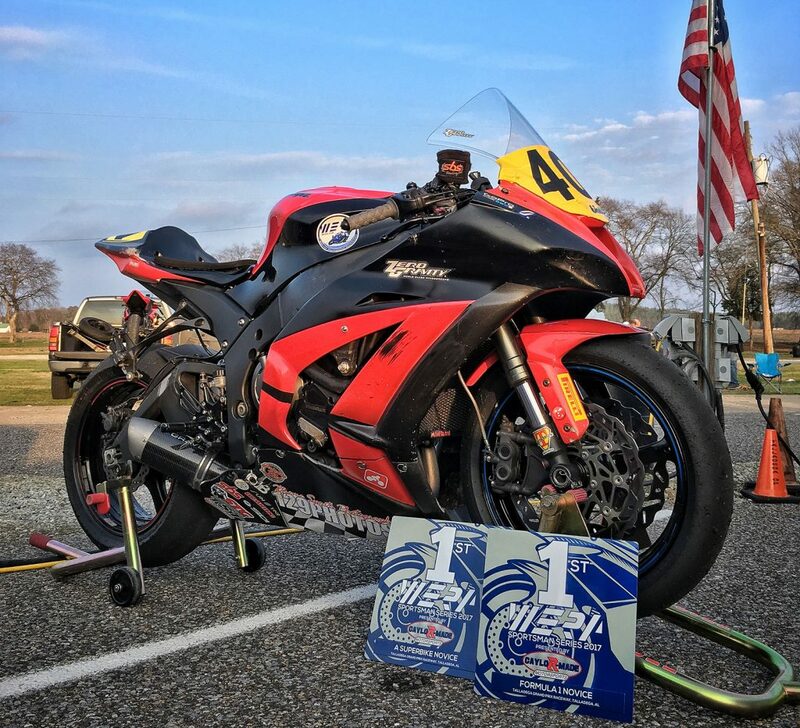 Having missed all of Saturday’s races, I really needed to get some points in another class, and A Superbike is one of my favorites to race. With only 3 races between my first race and this next one, I knew I needed to relax and rehydrate. Before I could get any of my gear off, my buddy, Tim Debusk, knew exactly what I needed to recover after the race — a bottle of water with my H2Pro Hydration tablet fizzing it up (I got him hooked on these things too). I can’t tell you how much these hydration tablets have changed my life in riding. After two years of using them at every track event, I’ve learned exactly what my body needs in terms of electrolytes and minerals to help keep fatigue, dehydration and muscle cramps at bay. It’s the only way I can ride now! Sipping my water I realize the first race left me rather exhausted and in pain. My whole left side felt weak and fatigue was setting in on all the injured areas from Friday’s crash. My left shoulder felt heavy and my lower back was now starting to feel stiff – like I just finished 3 sets of deadlifts after 3 months off (go figure). I’m sitting in my tired and worn out Walmart Special camping chair, with my eyes closed and in full gear. I tune out the conversations around me, close my eyes listen to my heart beat, take a few slow, deep breaths… “Just do your best.” I tell myself. The SC1s having about 20 laps on them at this point, I knew would be a little more loose but still could run race pace without a problem. However, help manage my fatigue and give me a little piece of mind, I decided to set my traction control level to 2 — something I’ve never done in a race before. Exiting pit lane, I hear the roar of a crossplane R1 from behind, “That must be Gary.” I think to myself — as I’m buzzed by a blur red and black. “Yep.” I knew right away what he was up to as I’m a believer that an out lap should be run at a good pace to get you, your bike and your tires ready to go for the race — but I just didn’t have the energy to do it. “Just do your best.” I remind myself again. As Gary parks it into T2 behind some more casual riders, I notice he shakes his head and it makes me smile a bit as I know what he’s thinking. My nerves are focused as I grid up on the 7th row, dead last. Last, because I have no points in the season yet, but no worries — I’ve been here before. As I tip into T1 I’ve moved up 4 positions with 4 more out in front (both expert and novice). By T4, I can tell I’m not at my normal pace, but it’s okay since I really need to save my energy for the later laps. On lap 2, I manage one more position, and I’m hovering in 3rd place overall. I maintain this position until I cross the start/finish and see the crossed white and green rolled up flag — half way home. I take a tight line and roll off the brakes a bit to dive in early and hopefully hold my line to take a block pass into the long straight ahead. IT WORKED! We rocket into 3rd gear approaching what I guess is around 130mph and go hard on the brakes into T2. The bowl pushes me down into the bike as I feel the g-forces are now starting to take their toll on my shoulders and lower back. As we enter the 8th lap, I know there is not much left in me. I’m using my thighs to squeeze the tank as hard as I can to take the pressures off my shoulder and back – but the left thigh is already giving out too. I run it waaay too deep into T2 and I see the familiar Ducati that has been stalking me for almost half the race is now ready to pounce. I know going into T4 I have a choice — run it tight, force him to make an outside pass or run wide, or run out and give him an opportunity to take the inside but give up a little on the drive. In the spit second I had to make a decision I think, “This is a hobby, not my job. I need to just finish the race and make it home safe. 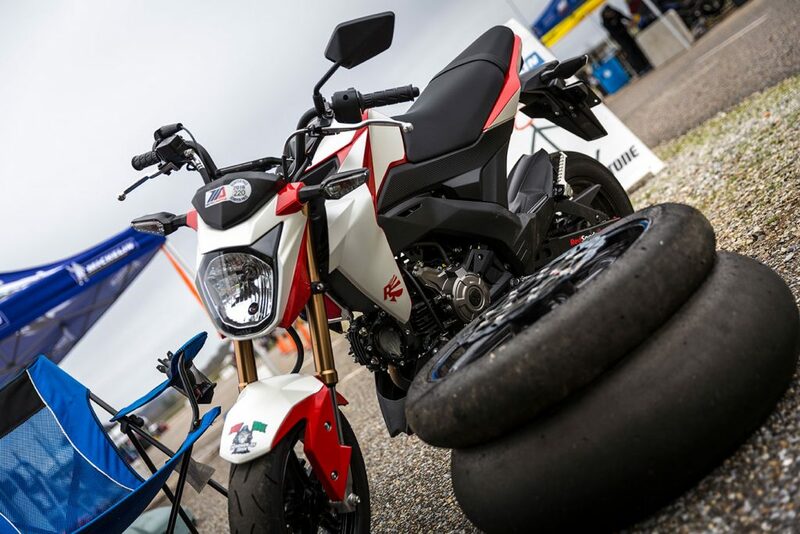 No need to push myself to have another crash.” — and I run all the way to the outside of the track and watch the Ducati roll comfortably underneath me. At that moment, a piece of me wanted to get that spot back right away and I drove hard to make up the lost time, but in the next corner I was quickly reminded just how tired I was and I collapse on the tank mid corner. That was it, I was done! I limp my way around the remaining 2 turns an onto the front straight — white flag! In the end, I took home two race wins this weekend! A feat I could only dream of in the days prior and all of last year. It’s still a bit surreal… and winning the first two races of the 2017 season is a fantastic feeling, it truly is. But I must say, persevering through doubt and the pain is by far the greatest feeling I’ve ever felt! I really hope everyone who rides has an opportunity to experience this feeling at least once in their life. It doesn’t even have to be in a race situation — it can be anything related to riding. Like getting back on the bike after a bad off, or having some other experience that may be preventing you from feeling the same joy you once had while riding, but no longer feel. Overcome your fears, extinguish doubt and never give up! A special thanks to all my sponsors — without them, I would not have been able to compete this weekend nor continue racing in this sport I love so much. Thank you all! Mr Spade loves design and photography. During the day, Mr Spade plays on the computer as a Web Developer and Designer and is an entrepreneur at heart. Standing 6'6" - if you ever want to find him - just look for the guy who makes any bike look like a 250cc.